Gaddafi says he will arm civilians to defend his people. "It is now necessary to open the stores and arm all the masses with all types of weapons to defend the independence, unity and honor of Libya," Gaddafi said in an audio message broadcast on state television hours after the strikes began. He said Libya would exercise its right to self defense under article 51 of the United Nations charter, adding the Mediterranean and North Africa were now a battleground. "The interests of countries face danger from now on in the Mediterranean because of this aggressive and mad behavior," he said. "Unfortunately, due to this (action), marine and air targets, whether military or civilian, will be exposed to real danger in the Mediterranean, since the area of the Mediterranean and North Africa has become a battleground because of this blatant military aggression." He also called on Arab, Islamic, African, Latin American and Asian countries to "stand by the heroic Libyan people to confront this aggression, which will only increase the Libyan people's strength, firmness and unity." 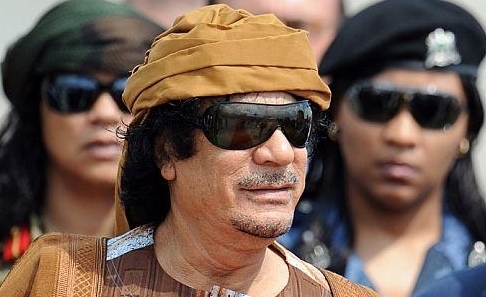 Shortly after Gaddafi's speech, a message on state television said Libya had decided to end its efforts to stop illegal immigration to Europe, citing a security source.